Needing MG-FZ Race Tires for Lancaster Streets Race? FREE Shipping Offer EXTENDED But Ends Tonight, Oct. 5! Online Ordering for Event Delivery closes tomorrow night Wed, Oct. 6! If you are racing at the 2nd Annual Streets of Lancaster Grand Prix race this coming weekend in the Open Shifter, TaG Senior, Spec Honda Heavy or Spec Honda Light classes, you need to race with the MG-FZ race tires WITH A SPECIAL SLGP STAMP! Tonight, Tuesday Oct 5th, is the deadline to order your race tires TO BE SHIPPED (at no extra charge) for the Streets of Lancaster Grand Prix event this weekend. Then, you have until tomorrow night, Wed, Oct 6th at midnight, to pre-order your tires for EVENT DELIVERY. Click HERE to order your tires online with a credit card. We recommend pre-ordering your tires to guarantee their availability at the track. Call 951-491-0808 with questions or if you need help. Have a great race! Breaking News! TaG Senior SOLD OUT at 80 Entries for SuperNats 14! Total entry count reaches 400! TaG Senior is the latest class to join the 2 other classes now sold out for Supernats 14 -- it reached it's 80-kart capacity today. TaG Master was the first to sell out at 40 entries on 9/24; TaG Cadet also sold out at 40 entries on 9/25. Although TaG Jr was opened up to 80 drivers on 9/28 -- after hitting the 40-kart maximum and then obtaining another 30 names on the wait list -- that class is predicted to sell out to 80, as well! Additionally, today is exactly 30 days 'til pre-entry cutoff! After Oct 31, it's registration at the track only, space permitting, with an additional $200 post-entry fee. 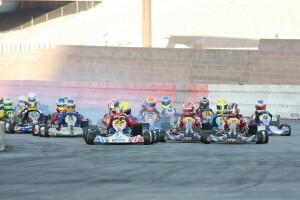 The 14th annual Superkarts! USA SuperNationals in Las Vegas is gearing up to be the largest field in the history of the great event, as entries continue to pour into SKUSA’s offices. With the Stock Moto categories enjoying amazing numbers, the TaG classes have made the biggest moves over the past couple of weeks as TaG Master and TaG Cadet have already sold out with over six weeks still to go. Likewise, the interest in the TaG Junior class has not let up and will enjoy a full field of competitors for the November 17-21 event – as after hitting its initial target of 40 entries a surge in the additions to the wait list has prompted SKUSA to open the class maximum up to 80 drivers. This will be the largest Junior race of the year and should not be missed. Oct 8th-10th will see the 2nd Annual Streets of Lancaster Grand Prix take over the city of Lancaster, CA. This will surely be a great event! If you are running the Stock Honda Light, Stock Honda Heavy, TaG Senior or Open Shifter class, you will be following SKUSA rules and required to purchase your race tires WITH A SPECIAL SLGP TIRE STAMP from us here at ProKart Challenge. You can purchase them at the track or you can order them ahead of time to be picked up at the event, or have them shipped to you at no charge up until Oct 4th. Click HERE for more info on this event. Click HERE to order your tires online with a credit card. Call PKC/SKUSA at 951-491-0808 for more information.